This Review was first published by The VOICE in October 2016. European asylum structures and processes ensure that every refugee is criminalized (for some, even before arriving in Europe). This criminalization is promptly and meticulously processed, and is manifested in various forms of societal and institutional discrimination and racism that ends with deportation. Deportation is criminal. It is criminal not only because of the obvious denial of the deportee’s right to freedom of movement and the right to decide his or her abode, but also because the physical and financial cost as well as the long-lasting psychological effects are not reckoned with and provided for by the deportation machinery and its advocates. In the worst cases, some die in the process of being deported while others are either dumped in countries where their lives are in danger or where they are actually killed by the forces they initially fled from. For some years now, the German authorities have been dubiously collaborating with foreign Embassies like the Nigerian Embassy in Berlin to issue Travel certificates to nationals from other African countries that are then deported to Nigeria with no guarantee of safety whatsoever. Although this scandal has been exposed, there is no doubt that both parties are continuing with this devious practice. The right to asylum and the protection from persecution that is the hallmark of the Geneva Convention is being rendered meaningless in Germany as the continued destruction of refugee rights assumes top priority for the state. Yet politicians, racist groups, misguided and ignorant individuals continue to blame refugees for all the problems in the German society to justify and stabilize the deportation culture and the social exclusion of refugees. In the last weeks and months, many Rromany families have been deported to the so-called ’safe countries of origin’ of the Balkan region. Majority of these states like Albania, Serbia, Bosnia and Herzegowina, Kosovo, Mazedonia and Montenegro are countries where discrimination, threats of and actual persecution make up the horrible daily lives of Rromanies. In none of these countries is there a guarantee of safety and security for the Roma but that is of no interest to the German government and their partners in the EU. Further deportations have been announced including deportation to Afghanistan that has recently commenced, but branded as voluntary returns. There are plans to intensify deportation as the dubious bilateral agreement with North African countries paves the way for the deportation of refugees from that region just as more countries are set to be declared „safe“. These are artificial safe countries. These countries are only safe on the paper on which German INTERESTS is boldly emblazoned and not for people who have fled to seek security and dignity for their lives. Refugees who refuse to sign the deceitful documents for voluntary repatriation of the foreigners’ office (Ausländerbehörde) live in the perpetual fear of being deported without notice to countries where some of them face death threats. This is a perpetual psychological torture that is deliberately designed by the German government to break the human will of refugees in this country. It is unconscionable. It is criminal and it must stop! Politicians of the ruling parties are zealously advocating for the deportation of thousands of refugees on a daily basis while the pro fascist parties have gone as far as calling for authorization for the police to shoot refugees at sight at the national borders. Spanish guards have shot and killed innocent refugees at their borders in Melilla and Ceuta since 2005 in addition to countless other horrible abuses but these hardly ever make any headlines. This is what has now been advocated in Germany, the heart of this very developed and civilized Europe where democracy and freedom overflows so much so that they want to export them to the so called under-developed countries. Let us unite to end the deportation and social exclusion of refugees in Germany! In these desperate times of aggressive attack on asylum rights geared to accelerate its total abolition and complemented by the increased right wing terror, violence and mass mobilisations against refugees in Germany, we want to offer a common opposition and a platform of solidarity against these crimes by the German state. It is not enough to engage in these prevalent superficial and unreflective “Refugees Welcome” initiatives where most ‘benevolent’ participants expect the ‘poor refugees’ to be grateful for being camped in tents and sport halls while being bombarded with second hand clothes and shoes. Refugee Power Matters – For Self-determination and Freedom! For over 20 years now, refugee voice have been consistent in bringing to the fore the pertinent issues of freedom and equality, human rights and dignity for everyone as well as our principled stand against societal and institutional racism and discrimination. But we have only been able to do this because of our ability at self-organisation, self-determination and consistency with our principled positions. This is why we have to continue with our self-organisation – Let’s organize ourselves in every refugee camp into political communities anywhere we are! Let us unite in solidarity with the relatives of those who died or disappeared on their way to Europe. Let us unite our solidarity against any form of repressions of refugees in the camps, in the streets of Germany and Europe in general. The more united, the stronger we are!!! We know that the reasons of our escape and flights from our countries are connected to the global exploitation and destruction of our home countries through wars and their so-called international treaties from the global dominance of the reach nations‘ capitalist hegemony. We are here because they destroyed our countries. Let us remember the people we left in our home countries where the puppet regimes that are beholden to Western interest continue to oppress them. Let us denounce the exploitation of our resources by the European countries that are, in collaborating with dictators and their partnerships in the corruption of the refugee countries while at the same time oppressing us here in Europe! Our self-determination and the political autonomy in refugee community networking are major references that are highly treasured. They are crucial to our continued efforts to maintain independent refugee community platforms. We call on all refugees to rise up to the challenge to uphold these principles by showing commitment to self-organisation and self-determination. We call on supporters and non-refugees to support the refocusing of our strategies on the way forward by uniting to empower the struggles of the refugee communities beyond the symbolic and philanthropic to genuine solidarity. Our primary aims and objectives are to unite in solidarity with one another without discrimination of any form, racism and sexism from the state, any other agencies or from the refugee communities. We want to promote socio – cultural and political exchange through regular meetings, discussions and events on the situation in our home countries and our situation in Germany. By organizing related events and activities in your tents, camps, regions and beyond, you and we BREAK the state sponsored ISOLATION and DEPORTATION of refugees in Germany. 22 years on the MOVE of The VOICE Refugee Forum as a Network of refugee Communities has taught us that UNITY is STRENGTH through an independent refugee political platform and self-determination in the refugee community with refugee activists and for refugees. Through our Community Networking, no refugee shall be left behind! Let us unite against deportation and deportation prisons, isolation and social exclusion in tents, sport halls, lagers and refugee containers! Without the community of the oppressed, there cannot be real struggle! The VOICE Refugee Forum is an independent community network of refugee political activists who are fighting for the respect of our human rights, equality, freedom and human dignity, for the basic existence of life, in human dignity and for Freedom of Movement. 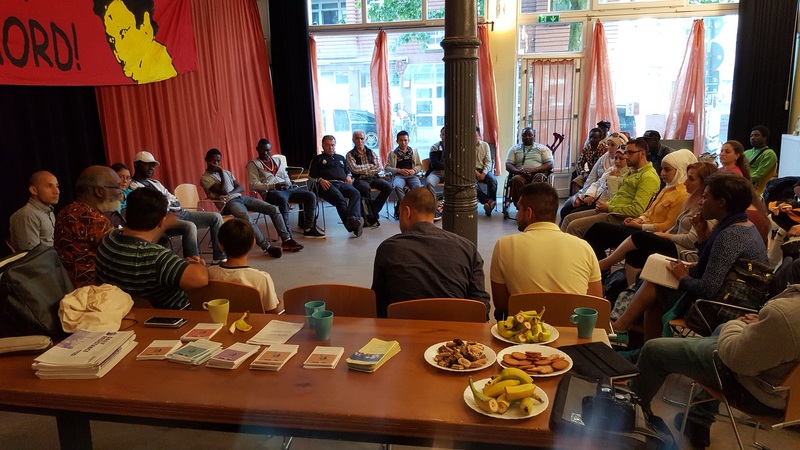 Appeal to Refugee Communities for Solidarity Network in Germany and Europe For a life decided by our quest for a free society, equality and human dignity. Fax Campaign for the Right of Residence of the Haliti/Ristic Family Stop the Deportation! For the right of residence of Shani Haliti and his both children Emil and Emanuel Ristic. Shani is a Romany from Kosovo. During the Kosovo war he was forced into the Serbian army and to fight Albanians. That’s why he had to flee to Serbia after the war. His life in Kosovo was in danger. Emil and Emanuel were born in Serbia. There they experienced discrimination because they are Romany people and Muslims. In school the kids have been victims of bullying and have been beaten up by their classmates. Parents of Serbian students forced the family to leave and also threatened their lives. The police didn’t help the family but blamed everyone – because they are Romany people. They have always been the culprits, even if there was no evidence. Roma Thüringen Erfurt- Break Deportation Now! Pour le droit de séjour de Shani Haliti et de ses deux enfants Emil et Emanuel Ristic. Shani Haliti est un Rom du Kosovo. Il a été forcé de faire la guerre, au Kosovo, dans l‘armée serbe pour combattre contre les Albanais. Par conséquent, il a dû fuir après la guerre en Serbie. Sa vie au Kosovo était en danger. Ses deux enfants Emil et Emanuel sont nés en Serbie. Mais en Serbie, la famille était discriminée et marginalisée parce qu’ils sont Roms et aussi musulmans. A l’école, leurs camarades de classe intimidaient et battaient les enfants et les parents des élèves serbes menaçaient la famille de les tuer si elle ne disparaissait pas. La police ne protégeait pas la famille et même disait que c’était de leur faute. La police ne voulait pas les croire, parce qu‘ils sont Roms. Pour eux, ils étaient toujours les coupables, pas besoin de preuves. Für das Bleiberecht von Shani Haliti und seine beiden Kinder Emil und Emanuel Ristic. Shani Haliti ist ein Rom aus dem Kosovo. Er wurde gezwungen im Kosovo Krieg in der serbischen Armee gegen Albaner zu kämpfen. Daher musste er nach dem Krieg nach Serbien fliehen. Sein Leben war im Kosovo in Gefahr. In Serbien wurden die beiden Kinder Emil und Emanuel geboren. Doch auch in Serbien wurde die Familie diskriminiert und ausgegrenzt, weil sie Roma und Muslime sind. Die Kinder wurden in der Schule von den Mitschülern gemobbt und geschlagen. Die Eltern der serbischen Schüler haben der Familie mit dem Tod gedroht, wenn sie nicht verschwinden. Die Polizei schützte die Familie nicht, sondern gab ihnen die Schuld. Die Polizei glaubte ihnen nie, weil sie Roma sind. Für sie waren sie immer die Schuldigen, auch ohne jeden Beweis. Daher kam die Familie im November 2013 das erste Mal nach Deutschland. Ihr Asylantrag wurde aber als „offensichtlich unbegründet“ abgelehnt, so dass sie im Oktober 2014 gezwungen waren, wieder nach Serbien auszureisen. Doch schon kurz nach ihrer Rückkehr begann die Ausgrenzung und Gewalt gegen die Kinder in der Schule wieder. Ebenso schnell kehrten die Drohungen der Eltern der Mitschüler zurück und es kam zu Misshandlungen durch die Polizei. Shani Haliti wurde über mehrere Stunden von der serbischen Polizei geschlagen. Und sie kündigten ihm an, dies zu wiederholen. Du browst gerade in den Break Deportation! Gemeinsam gegen Abschiebung & Isolation Weblog-Archiven nach dem Monat November 2016.